Kids’ Club airs live every weekday morning and is packed full of engaging Christian content for children. Presenters play guitar and teach simple praise songs. Children are taught simple crafts from materials readily available at home. The presenters also prepare and demonstrate how to make snacks at home to encourage healthy eating and teach children about nutrition. All these elements help to deliver an absorbing magazine-style programme for 7- to- 11- year-olds. As ever with SAT-7’s programmes, the overarching aim of the programme is to share God’s love with those watching. In this case, Turkish children are taught to address everyday issues in a loving biblical way. In each episode of Kids’ Club, there is practical teaching from the Bible. The topics discussed range from spiritual issues such as how to pray, love for our enemies, applying God’s word, the Holy Spirit, and God’s love and forgiveness. In addition, the presenters teach children how to respond biblically to emotional and practical issues such as anxiety, grief, jealousy, tolerance, responsibilities at home, arrogance and being a good example. 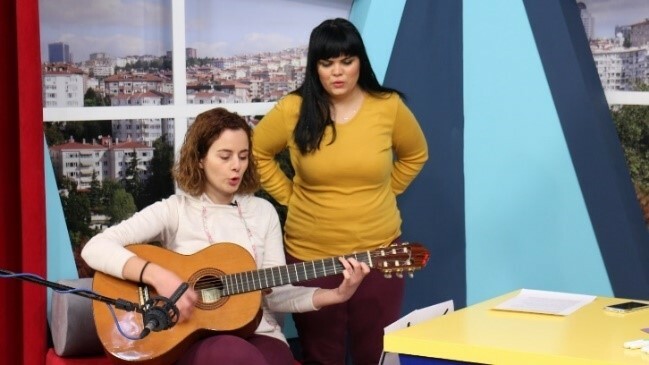 Broadcast five mornings a week for one hour, Kids’ Club follows on from the previously successful live Turkish children’s show, Morning Joy, with a mandate to include more direct Christian teaching in a fun and compelling way. SAT-7 wants to show children that God loves every part of them and wants to encourage and strengthen them spiritually, emotionally and physically.